Partner with AUT on Bachelor of Computer and Information Sciences (BCIS) projects and you have access to fresh ideas and additional resources in the field of computing. 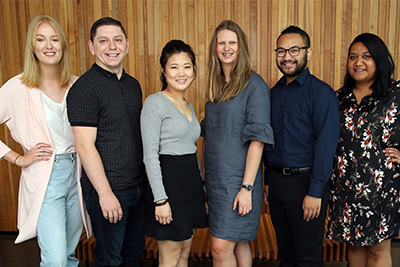 This experience gives industry or non-profit organisations the option to support the development of young professionals to cover their own demand, and it develops valuable networks and future opportunities for final-year AUT Bachelor of Computer and Information Sciences students. Each third-year BCIS student must complete 300 hours of work in one project over two semesters. Industry sponsors define a project and mentor a team of students. Normally three or four students work in a team. This work should provide solutions to specific problems, eg analysing business processes and IT requirements, software evaluation and implementation, software development or commercial research. YMCA Camp Adair website development – including new booking function and ability to create customer accounts. DataFinder (graphical data management client) – modifications to enable it to connect to a storage server system, using Python and Linux. Password security and protection – devising a three-layer login system that encompasses a traditional user name and password system, a graphical authentication system and a cognitive security mechanism. Additional resources for solving specific IT-related problems without paying wages. The chance to release experienced staff for urgent or highly professional duties. Access to a pool of talented computing students you could hire for future job openings. As a project sponsor you deliver a proposal that includes a detailed description of the project, constraints, reasons, research methods, desired outcomes etc. Your organisation should provide the details for at least one contact person who should be available for meetings and to answer students' questions on a regular basis (at least one hour a fortnight). The contact person's feedback will contribute to each student's final mark for the project. AUT contacts industry or non-profit organisations to find projects for third-year computing students, evaluates potential projects and assigns projects to teams of three or four students. It allocates an academic supervisor to each project. AUT organises workshops, provides computers and meeting rooms. Students are expected to work in a manner befitting IT professionals or researchers – however they are students so will require guidance and support from your organisation. There is no charge to industry sponsors for the work of student project teams. However we hope sponsors will make their time or resources available, or offer financial support for travel expenses. Arrangements between sponsors and students about confidentiality and IP ownership are open for discussion and can be amended. A Non-Disclosure Agreement between students, academic staff and sponsors should be signed before the work starts. New projects run from July 2019 to June 2020. Please submit your project description by 4 June 2019.